The content doesn’t push a specific product—it’s a soft-sell technique that most often serves a long-term brand personality or positioning strategy. Content Marketing is an effort to establish alternate brand journeys, and offer more value to an end-consumer. When done well, it can diversify audience segments, help you be present in the moment, build equity and increase opportunity for valuable brand engagement. It’s antique—is that why it’s trendy? 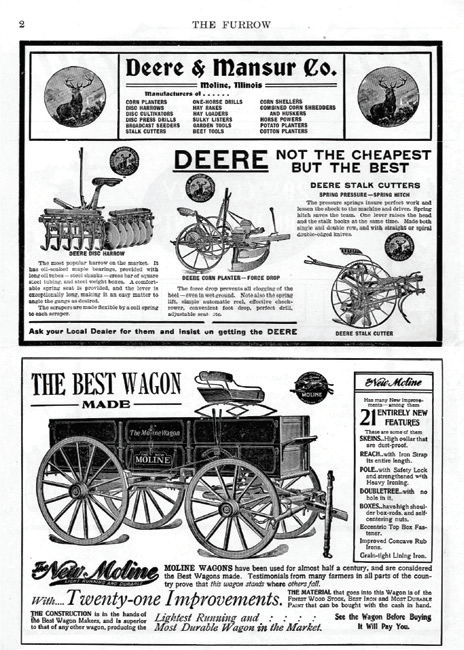 Content Marketing as an advertising method isn’t new. In fact, it's one of the oldest forms of mass marketing. Back then, smart people working for big companies knew it was more effective to create content that their audiences love to consume, than to advertise alongside content they didn’t produce. In the past five years, digital marketing, with the obvious aid of social networking, has taken a greater share of marketing and advertising budgets. The competitive rush to digital means that brands—and agencies—are pushing themselves to be more creative, reach more people and leave stronger, more memorable impressions. And the most cost-effective and purposeful way to do it online? Content Marketing: queue the resurgence. John Deere published their first edition of The Furrow, a magazine distributed to farmers and ranchers to educate the industry about innovation, technology and business entrepreneurship. In 1904, Jell-O hired salesmen to go door-to-door distributing a free recipe book packed full of practical Jell-O inspired dishes. 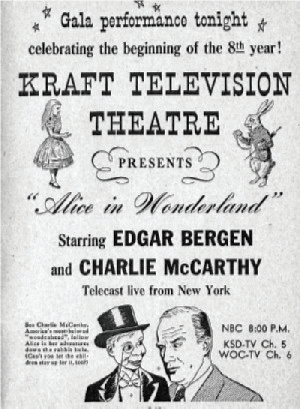 In 1947, Kraft first broadcasted Kraft Television Theatre, a regularly scheduled live drama series that adapted popular New York plays. 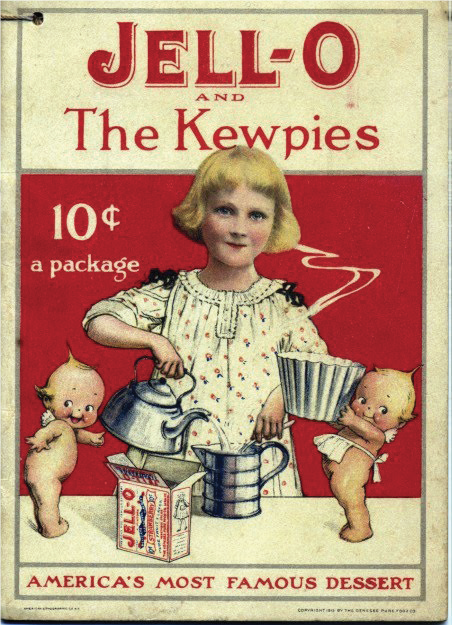 Each week, the series were “intermissioned” with product advertisements that celebrated different Kraft recipes. WHAT ARE SOME BENEFITS OF CONTENT MARKETING? Content Marketing creates additional brand experiences outside a product’s primary use. The more times and the more ways audiences engage with a brand, the further along they are down the conversion funnel. 1,2,3 impressions can turn into vocal brand recall, website traffic or best yet, purchase. 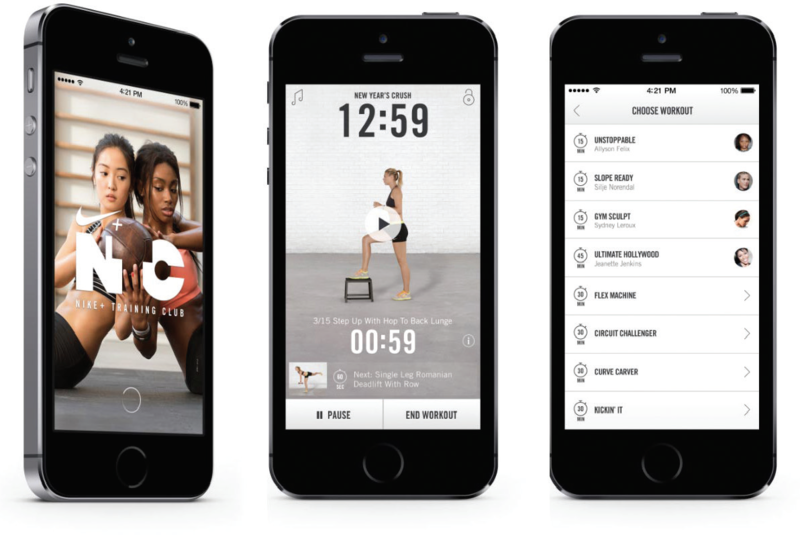 Think about Nike’s fitness apps. The content they offer is free, incredibly well-shot, technical, and easy to use. The tools are on-brand by promoting physical health and reputable by leveraging their athlete sponsorship contracts to offer additional influencer merits. A casual Nike fitness app user needs a new pair of runners—which brand do you think they’re likely to try on first? Effective Content Marketing enhances your SEO. You’ve heard it, we’ve heard it, you know, we know: SEO isn’t about page links and keywords. Now, SEO is about a complete digital presence online. The more relevant and consistent content your brand has on each digital platform, the better your page will rank on Google, Bing or Yahoo. Not just that, but depending on their age demographic, users are just as likely to use social search to find your business than traditional search engines. Investing in content marketing and ensuring your social pages always reflect what your company has to offer is sure to increase your conversion traffic through Facebook, Instagram, Pinterest, Twitter, etc. Content Marketing gives your internal team more to work with. The more articles you write, videos you share or podcasts you record, the bigger your content bank will be. Every piece of quality content can be reused in various ways across each digital or traditional platform. The more content you create, the greater the likelihood you are found. And with impressions comes domain authority – a key in Google’s ranking algorithm. Content Marketing increases the equity for your brand. Don’t just visit West Elm to buy a trendy coffee table, head to their Instagram page for decorating inspiration, their blog for videos of interior designers arranging a guest bedroom, or listen to their podcast about how house plants serve to brighten up your space AND purify your air. The more content you have, the more ways audiences can interact with your brand. The more ways they use your brand, the more likely they are to refer products or finish their trip down the sales funnel. We know the overall benefits of Content Marketing. But how do you start? Before anything, write quality, consistency, and relevancy on a piece of paper, then tape it to your planner, computer monitor or the wall beside your working space. Never forget that your content marketing efforts are only successful if you consider each of these attributes every step of the creative process. Define success, measure it, compare to the past, try to learn what purchase intent behavior looks like, tie your social analytics to web analytics and learn what to look for. With your team or agency, brainstorm and solidify the types of content you’d like toshare—tips or educational tools, opinion articles or videos, funny meme’s, etc. Not every brand should use every tool in the toolbox. Too often we see brands creating beautiful content, but copy and pasting it across each platform. A fine example of quantity over quality. There is tremendous value in identifying where your audience is, and investing in platforms that highlight the merits of your content. • Telling a lengthy story to men between 25-35? Podcast. • Filming a comedic web series targeted towards teens? SnapChat or website. In addition to traditional research and experimentation, Sherpa always kicks off a content marketing strategy by playing with a content matrix. It’s a quick and adaptable tool that evaluates which platforms are most cost-effective and on-brand for a specific client. Follow this template or add your own evaluation categories like in-house experience, already existing assets, previous performance, etc. I. Write down each platform or publishing tool that you’re considering. 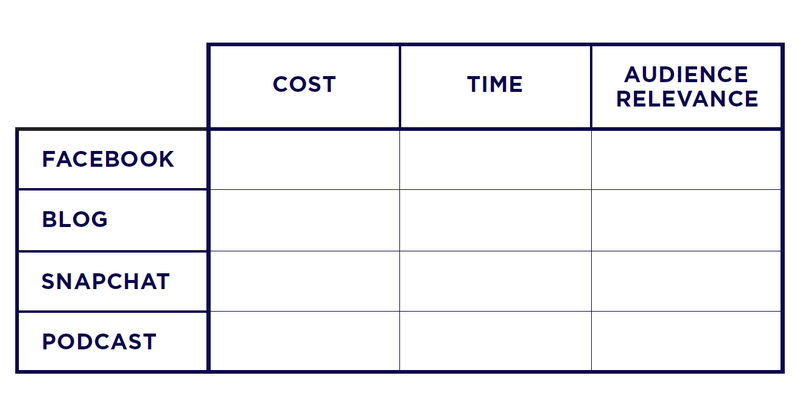 Beside each platform create three columns titled, Cost, Time, Audience Relevance. II. Next, rank each on a scale of 1-4—one being the cheapest, timeliest and most relevant. If you’re struggling with identifying costs, think about hours it will take to create content (in-house or freelance?) —this includes employee hours, production tools, research requirements, etc. *Let’s use below as an example of a small retail boutique with a limited budget. They plan on featuring style trends, tips on how to accessorize for specific events and employee personality profiles. What does our matrix tell us? If the boutique has a limited budget, they’re best to invest in creating content that lives on Facebook and SnapChat. III. Organize: Stretch your Content Marketing Budget with Editorial Calendars & Content Repurposing. When is this being created, when is this being published? What’s trending, what are our audiences using? Where can someone find the images in existing file management systems? Educational, industry trend critique, inspiration. Is this content good enough to put money behind? Sharing the same content word-for-word on each platform: no. Adapting and modifying the same ideas, images and themes across each platform: yes. After spending time creating a series of do-it-yourself tips for your blog, it’s important to share your efforts on your active channels to increase views, conversions and reap the full benefits of your content investment. The best way to do so is by saving time and filling your editorial calendar with repurposed content. Spending four hours writing a blog post and securing quality images may seem like a wasted effort. But think past the “share” button, and see the potential your theme has reused in other ways. • Long-form to short from. You’ve already shared the link to your blog on your Facebook page. But two, three, six weeks after initial publish, there’s nothing wrong with adapting your 10 paragraph article into a 10-sentence summary on your Facebook page. Highlight the key points, share one of the back-up images, and you’re good-to-go. • From podcast to video. Easier than you think. Nobody gets their winning shot first try, right? Compile all the images you took while building assets for a blog post and create an album on Instagram. Link this back to the original article or add an anecdote about your creative process. Establishing a cohesive and robust content marketing arm of your marketing department takes time. We never promise clients significant ROI for at least 3-6 months after implementing a custom strategy. Why? Audiences already have habits. They consume content on a regular basis and it takes a significant disruption or value-add for them to introduce new content into their consumption patterns. The more insightful and engaging content you create and publish on a consistent (Quality, Consistency, Relevancy) basis, the better chance you have at penetrating patterns. But, quality isn’t exclusive to what you’re creating, writing, filming, or sponsoring; it’s also taking time to evaluate how consumers are engaging with your content using data analytics to drive business intelligence. Sherpa is known for going beyond what we call “surface level metrics” to use a combination of software devices and analytics tools that show us what content elements or platforms perform well, to which audiences. We track conversions and user behaviors while on-site and rely on A/B testing on various publishing tools to track data that can inform how we adjust our content going forward. This process allows us to see holes and opportunities. Each comes together to build actionable insights that better equip your content marketing efforts. All-in-all, any content efforts you create on a regular basis will serve your marketing department—even if the value comes after your team may have thought that your initial ideas didn’t resonate. Still not convinced in the value of storytelling? Drop a line—we’re marketers, and also great debaters.